We are routinely accepting applications for part-time field and laboratory research technicians. We also offer volunteer opportunities. Contact Emily Standen at estanden@fiu.edu for more information about current employment and volunteer opportunities. Interested in graduate or undergraduate student research? Contact Tiffany Troxler. Some of these research opportunities are briefly summarized below. Go to the research projects page for further information about our key research activities. 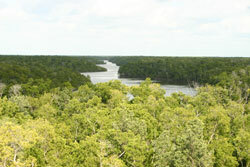 Mangrove forests occupy extensive areas in some areas of the coastal tropics and are an important component of the global C sink. In collaboration with colleagues at Everglades National Park, Penn State, and FIU we are working on soil C dynamics including soil respiration, litter decomposition and soil-water CO2 to contribute to work on mangrove ecosystem C budgets in the Florida Coastal Everglades. Numerous research opportunities are available. In the Florida Coastal Everglades, salinity, inundation and phosphorus are key drivers and the interaction of their effects on coastal ecosystems, particularly mangrove and southern marl marshes are largely unknown. 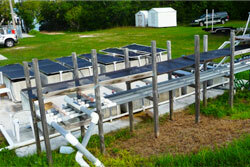 In collaboration with our colleagues at the South Florida Water Management District, Everglades National Park (ENP) and Everglades Foundation, we are conducting experiments to investigate questions about sea-level rise effects on coastal ecosystems at the ENP Key Largo Ranger Station in the Florida Keys. 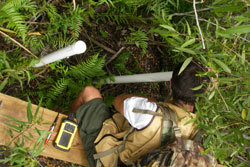 Since 2006, we have been conducting groundwater and nutrient monitoring in Everglades tree islands. 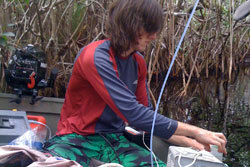 Our goal is to understand the effects of hydrology on tree island phosphorus dynamics. Of critical importance is to maintain the extent of tree islands in the Everglades to preserve aspects of its landscape structure that also contribute to wildlife habitat, cultural resources and phosphorus stability of soil phosphorus. An improved understanding of the potential for tree island restoration is another important goal of this work. In Taylor River, an estuarine creek in the southeastern Everglades, Alan is sampling the creek water column profile to determine variation in water quality, including conductivity and dissolved phosphorus. 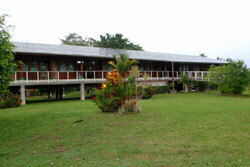 The Bocas del Toro Research laboratory of the Smithsonian Tropical Research Institute is a top-notch, well-equipped base from which to conduct research in the many beautiful coastal and marine ecosystems of the area including mangrove forests, freshwater peatland forest, and estuaries. Opportunities available for research activities that focus on plant-soil interactions and ecosystem C dynamics in tropical peatland ecosystems. 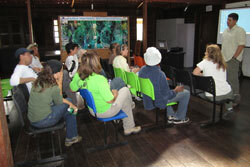 El Refugio, adjacent to the Noel Kempff Mercado National Park, offers a remote base from which to conduct research in the Bolivian savanna-forest island landscape. 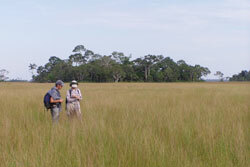 River flooding and local precipitation moderate the hydroperiod of the savanna, which results in a marsh-type habitat analogous to short hydroperiod marl prairies of the southern Everglades. This area is also home to maned wolves, yellow anaconda, jabiru stork and black jaguar. Reconnaissance missions and research proposals in conjunction with partners in Brazil and multiple universities are directed toward graduate research opportunities in the South American Pantanal, the world's largest wetland.